Last weekend, Dickinson’s new Center for Advising, Internships & Lifelong Career Development held a bootcamp for seniors, and more than 100 students spent the afternoon developing a concrete plan for life after Dickinson. With sessions across the career-launch spectrum, center staff laid out critical steps for students looking to land their next opportunity while also filling in possible blanks in students’ resumes. Resumé boost: This session gave an overview of how to position coursework, internships and volunteer and leadership experiences on a resumé and create conscience and impactful descriptions that demonstrate the breadth, depth and impact of the experience. LinkedIn: This session helped students see ways to match their resumés and LinkedIn profiles to job listings and finesse their LinkedIn summaries to better match opportunities of interest. Finding a job through networking: Students learned why the old method of “apply and wait” isn’t the best way forward in the job application process and how tapping into existing contact lists can give job-seekers a leg up. Effective interviewing: Students discovered ways to communicate their liberal-arts experiences effectively in an interview and structure thoughts to deftly answer the most common types of interview questions. Developing a job search plan: Students designed action plans to stay on track and keep organized by developing a prospect list, timeline and specific goals for the job search. 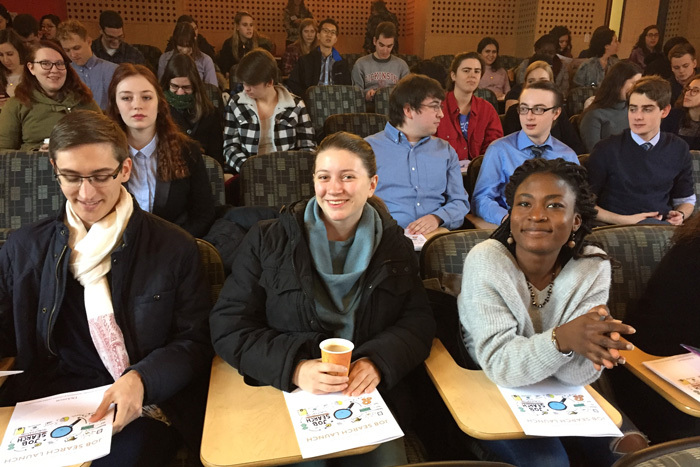 The event is only one of many to follow, and Kondas sees sessions like these as a great way for students to give themselves a big push as they approach graduation.